The Adult Use of Marijuana Act, otherwise known as Proposition 64 or Prop 64 is a highly controversial Bill. Unlike its counterpart that was proposed several years ago, Prop 64 is predicted to pass by overwhelming odds. Proposition 64 controls, regulates and taxes sanctioned usage of marijuana in hope of protecting the children, the public, and the environment. As this is, Prop 64 establishes certain rules and guidelines that maximizes safety, limits exposure, and allows for business growth. Usage: Prop 64 Allows for recreational Usage of Marijuana for adults 21 years of age or older. Smoking is only allowed in private residence or at a licensed business location. Driving under the influence and public consumption is strictly prohibited. One person would be able to carry up to an ounce of marijuana and up to 8 grams of concentrated marijuana. Sellers: A business would require a state and local license. Large scale production is prohibited for 5 years along with the selling within 600 ft of a school or youth center. Regulators: The Bureau of Medical Cannabis Regulation is to be named the Bureau of Marijuana Control and tasked with the licensing of Marijuana businesses. How is this to be taxed? Two new excise taxes would be implemented. 1.) For cultivation charging $9.25 per flower and $2.75 per ounce for leaves. 2.) A 15% tax on the retail price of Marijuana. Where does the tax money go? Those administrating and enforcing policy. Within these percentages, a portion of revenue will be allocated for medical marijuana research and to studying implementation outcomes. Creating a community reinvestment fund that will allocate tens of millions of dollars annually towards economic development and job placement for neighborhoods most in need. 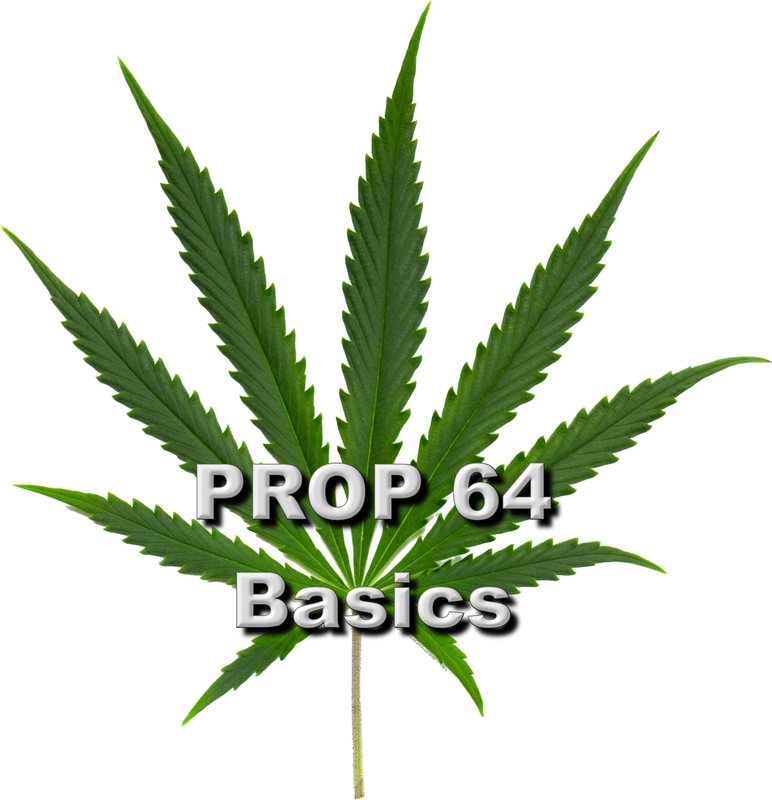 Prop 64 will go into effect after this voting cycle if approved by voters. These policies and taxations are subject to change as seen fit by municipal and county governments. It is not our place to tell anyone how to vote. Opinions on this subject are all over the board. It is our opinion that the criminalization of cannabis has done more harm than good. While this law does not eliminate it, it is a step in the right directions. Cannabis has well documented beneficial properties which is more than can be said about alcohol and cigarettes. We support the responsible recreational use of cannabis.